Boogity Bog is the third level of the world Ghost Island where Donkey and Diddy Kong venture through in the game DK: Jungle Climber. 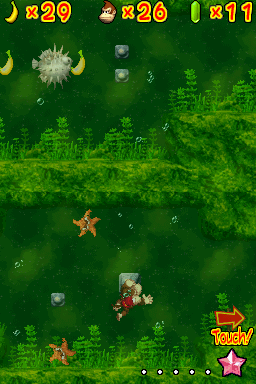 This level appears to take place underwater and seems to have many whirlpools and rough water currents in the swamp, making it rather difficult for the Kongs to swim. The Kongs can find themselves in an area with currents that makes them go everywhere, which can be stopped by several switches. Enemies in this level include the original Donkey Kong Country 2: Diddy's Kong Quest and Donkey Kong Land 2 enemies; Puftups, Lockjaws and Shuris who get in the Kongs' way in this level as another obstacle. This page was last edited on April 5, 2019, at 13:02.